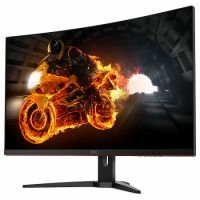 as well as AMD FreeSync support just like its Full HD G1 Series siblings. Offering increased fidelity and details thanks to QHD resolution, a huge enveloping 31.5” display size and 1800R curvature add a whole new level of immersion to the gameplay experience. The CQ32G1 is available in Europe as of February with an MSRP of £ 359. AOC’s CQ32G1 is available in February for an MSRP of £ 359.